Pinterest for Business – Exciting New Initiatives You Need to Know About! Pinterest for Business - Exciting new initiatives you need to know about! ﻿﻿- There has been no shortage of functional updates and strategic moves by Pinterest over the last ﻿﻿﻿﻿few months. To turn Pinterest into a profitable business, product updates as well as new business partnerships are being introduced on a regular basis. International expansion and retail alliances are clearly high on Pinterest’s agenda. If you are marketing your business on Pinterest, read on and get excited! Find out about some of the cool business initiatives launched by Pinterest this year. This year Pinterest continues to work closely with a number of retail brands. Retail brands are increasingly seeking ways to connect their offline merchandise with their online presence. As part of a Mother’s Day campaign, JCPenney teamed up with Pinterest in an effort to attract more customers to their brick-and-mortar stores. They tested the hosting of live Pinterest boards created with the help of bloggers who shared their favourite styles and trends on offer in JCPenney stores. As a result, JCPenney will be deploying digital Pinterest boards in shopping malls all over the US. Another very interesting retail trial is currently taking place at Brazil’s biggest design furniture retailer, Tok&Stok. Real-life Pins let shoppers save in-store items to their Pinterest boards through the “Pinlist” app. At the push of a button, the Tok&Stok store can be turned into a giant pinboard. An excellent way to make a wedding list, for example! It’s a perfect example of in-store and on-line integration. To see this in action, take a look at the video below. The future for shopping on Pinterest looks very rosy indeed. 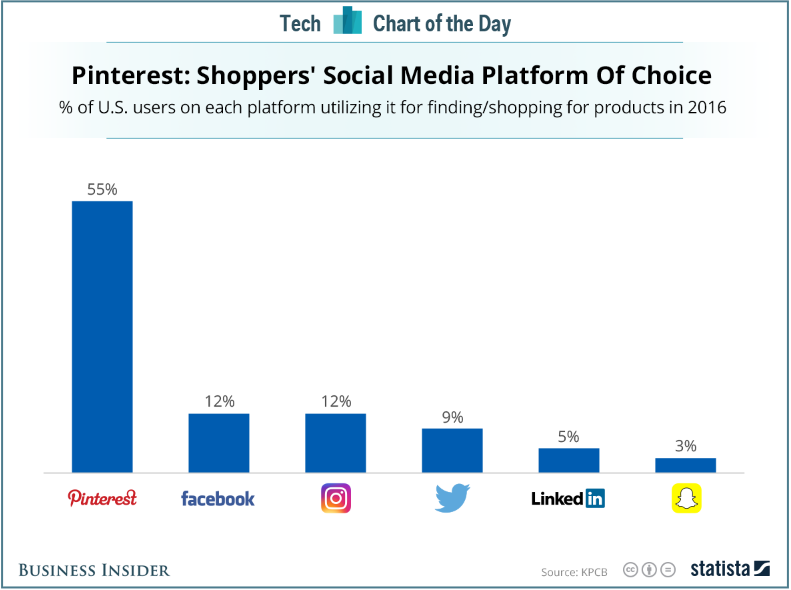 For online shopping, Pinterest towers over Facebook and Instagram. In a recent article, UK Business Insider reported that according to data from Kleiner Perkins' 2016 Internet Trends report “…55% of US internet users indicated their primary use of Pinterest is for finding/shopping for products”. Promoted Pins are converting and get improved targeting! Pinterest announced earlier this month that Promoted Pins drove five times more ins-store sales than the industry average. This is based on a recent study where in-store sales were measured for 26 Promoted Pin campaigns across major food and drink, household goods and beauty brands. Pinterest has partnered with Oracle to measure how Promoted Pins impact offline sales. A small but important change, driven by the push for global growth, was the replacement of the Pin It button with a Save button. Although the Pin It button was an integral part of the platform’s identity, “Save” simply makes more sense for an international audience. Tests run by Pinterest confirmed that “Pinning” is less universal than “Saving”. The Save button resulted in much higher pin rates by new Pinners, especially outside of the US. Besides, the button change, other projects confirm Pinterest’s determination to expand into non-US markets. A couple of months ago, it started rolling out Promoted Pins in the UK, the first country outside of the US where advertising has been introduced into its business model. Among the first brands to try them out are John Lewis, B&Q, Nestlé and Tesco. At the same time, Pinterest expanded its marketing developer partners scheme to the UK. They are building a strong partnerships with media and creative agencies to help businesses get the most out of Pinterest. The British market clearly appears to be a priority for Pinterest. Within Europe, it is one of the most active pinning communities with more than 3 million different ideas pinned by Brits every day. The UK was chosen to run the first-ever Pinterest TV ad campaign to show people just how relevant the site is to audiences outside the US. The UK’s European neighbours are eagerly observing Pinterest’s moves on the other side of the channel. The question is how and when Pinterest will tackle expansion into their markets, which is a bit more complicated due to language and cultural differences. Is Pinterest ramping up business in France? Being curious, I decided to click on the link, but nothing much happened. Could this be a sign that the introduction of Promoted Pins are imminent in France? Not so sure. In a recent interview, Tim Kendall, Pinterest President, indicated that Promoted Pins would be rolled out in other English speaking countries first this year. This probably means that the earliest we can expect Promoted Pins in France is 2017. Since the start of 2015 Pinterest has been ramping up its efforts to generate revenue, when it officially began selling ads to marketers in the US. Now, it is clearly stepping up a gear in Europe. After the UK, is France next on the list for global expansion? I am keeping my fingers crossed! Want to be first in line when Pinterest Ads are rolled out? Are you ready? If not, now is the time to get started! There has been no shortage of functional updates and strategic moves by Pinterest over the last few months. To turn Pinterest into a profitable business, product updates as well as new business partnerships are being introduced on a regular basis. International expansion and retail alliances are clearly high on Pinterest’s agenda. If you are marketing your business on Pinterest, read on and get excited! Find out about some of the cool business initiatives launched by Pinterest this year. Previous Post Why Pinterest Group Boards Matter. How to get on board! Next Post How to be awesome on Pinterest: Inspire Travellers Right Now!